I know next to nothing about jazz singer and Civil Rights activist Nina Simone (other than the recent controversy about casting for the new biopic). But I do know Regina Marie Williams, Aimee K. Bryant, Jamila Anderson, and Traci Allen Shannon, the four women starring in the new play based on Nina's song "Four Women." 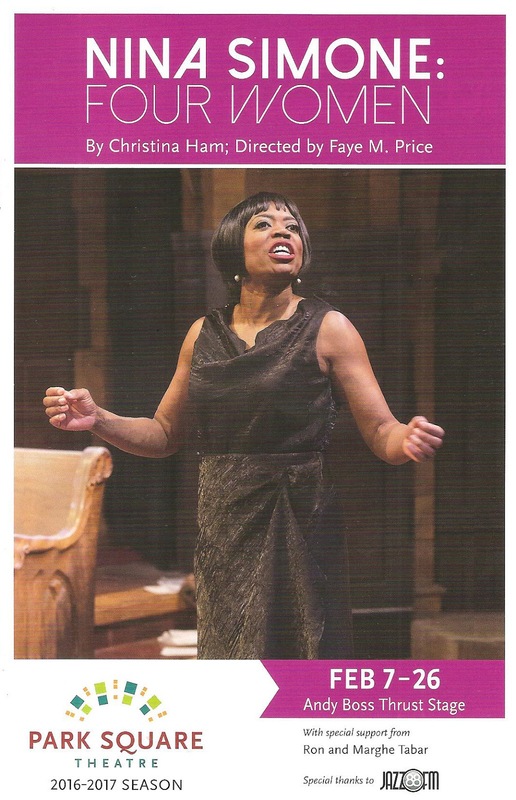 So I knew I was in for a treat and an education with Park Square Theatre's world premiere of Nina Simone: Four Women, written by local playwright Christina Ham and directed by Pillsbury House Theatre's Faye M. Price. I was not wrong on either count. Proving once again that everything I know I learned from theater, I now have a greater understanding of the remarkable and talented woman that was Nina Simone, as well as the importance of her music and her voice in the Civil Rights movement. And watching these particular four women, some of the best voices and actors we have here in the Twin Cities, bring full and complicated life to the Peaches, Auntie, Saffronia, and Sweet Thing of Nina's song, is a treat of the highest order. 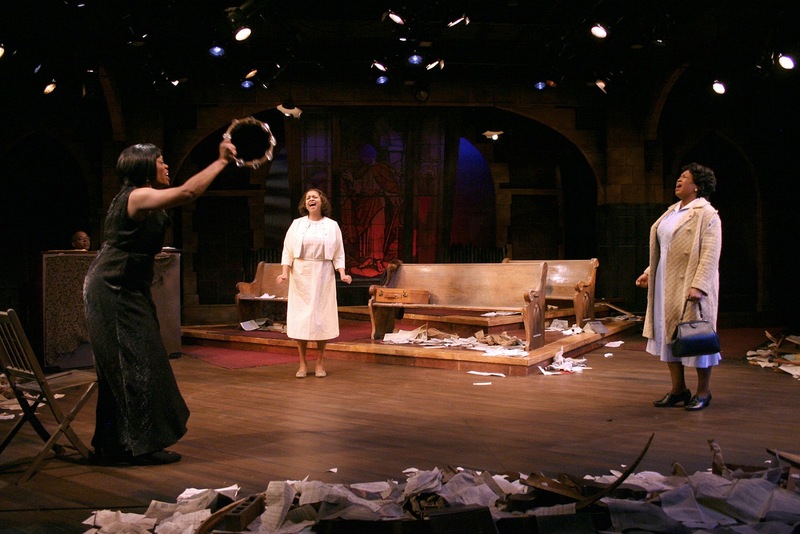 The play takes place on one day in the 16th Street Baptist Church in Birmingham, the day after it was bombed and four girls killed in 1963. Nina Simone (Regina Marie Williams) and her pianist brother (a mute Sanford Moore, who also music directs) sneak into the church, hoping for inspiration to finish her song "Mississippi Goddam" that she's writing in response to the bombing and other tragedies. Soon the other three women file in, looking for shelter from the riots outside. 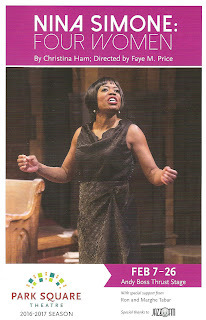 Auntie (Aimee K. Bryant) is a working class woman on her way to work cleaning houses. Saffronia (new cast member Jamila Anderson, taking over from Thomasina Petrus) is a school teacher active in the women's Civil Rights marches and protests. Finally there's the prostitute Sweet Thing (Traci Allen Shannon), with a chip on her shoulder and a knife in her hand. The four women discuss things political and personal, and find that despite their differences, they have much in common. Throughout the conversation, Nina continues to work on writing new songs and singing old ones with the other women. This is a play with music, and while I wish the audience didn't applaud after every song, breaking the spell and the flow of the story, it's nearly impossible not to respond with enthusiastic applause after hearing these women sing these powerful songs a capella or with simple piano accompaniment, or accompanying themselves with makeshift percussion instruments drawn from the rubble. All of these women are fantastic, but Regina really commands the room as Nina in her elegant long gown and sleek wig (later removing it a la Viola Davis), strong, proud, angry, and fiercely determined to use her music to make a positive change in the world. Playwright Christina Ham has cleverly constructed a play based on this brief song, fleshing out these four stereotypes of black women into full and complete characters. Some of Nina's dialogue is quite poetic; at intermission I jotted down a few lines that really help to define Nina and the change in her music. Lines like "I'll slay them with my lyrics now and save the bullets for later." "My audience shouldn't expect to sip martinis listening to my music unless they're prepared to choke on the olive." "People are marching for change in the streets, how can I continue to sing songs that don't reflect the current condition?" Park Square's basement thrust stage has been turned into a bombed out church by scenic designer Lance Brockman with impressive detail. 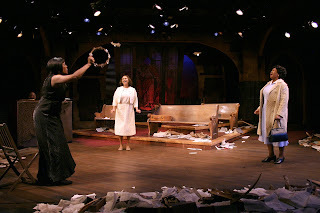 In the intimate theater you can walk right next to the stage, where you will see pages of hymnals, fans, and bloody bits of glass amidst the piles of rubble. A few pews, a cross hanging off the axis, a partially shattered stained glass window, and a fortunately unharmed piano populate the thrust stage. Nina Simone: Four Women is a powerful and important play about a powerful and important woman who used her incredible musical talents to fight for justice for her people and all Americans. Her music, written 50 years ago, is just as meaningful today, and this play brings her music and her message to the forefront (continuing through March 5).